Em, Han and I went to the city this morning. 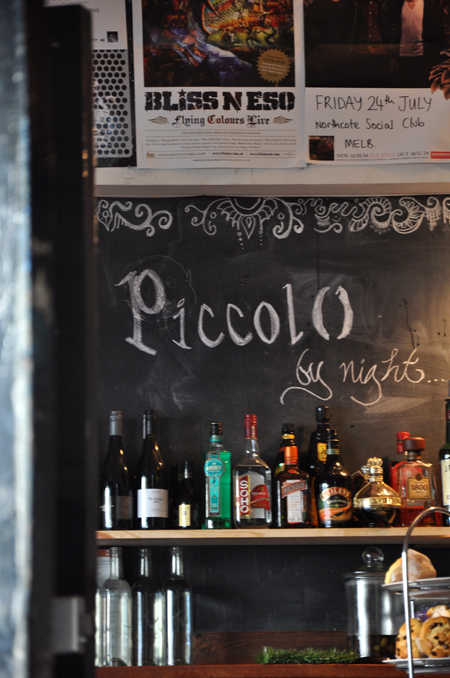 I showed off Piccolo and Chapel St Bizzare. Then we wound up at the Art Gallery to check out the Persuaision fashion exhibition. It was small and quite disappointing, the only real redeeming feature was that they had Colin Firth’s Mr. Darcy costume on display, the dresses weren’t very exciting. Had a wander through some of the European section too – love the Mogdilangi that hangs next to Picasso’s Weeping Woman. Then had a sweet little jaunt down Degraves St for a coffee in Hells Upstairs/Hell’s Kitchen and a wander through a few arcades. 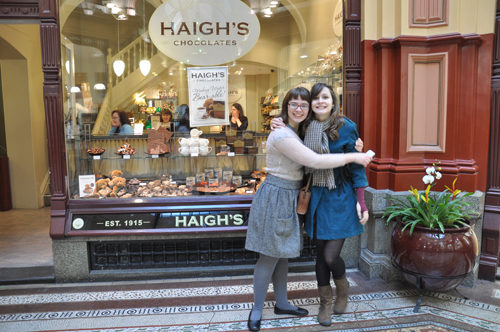 And had to get a photo of Han (right) infront of Haigh’s as that’s my nickname for her, Emily just likes being in photos. Niiiiiiicccccccce! Makes me miss my sisters.